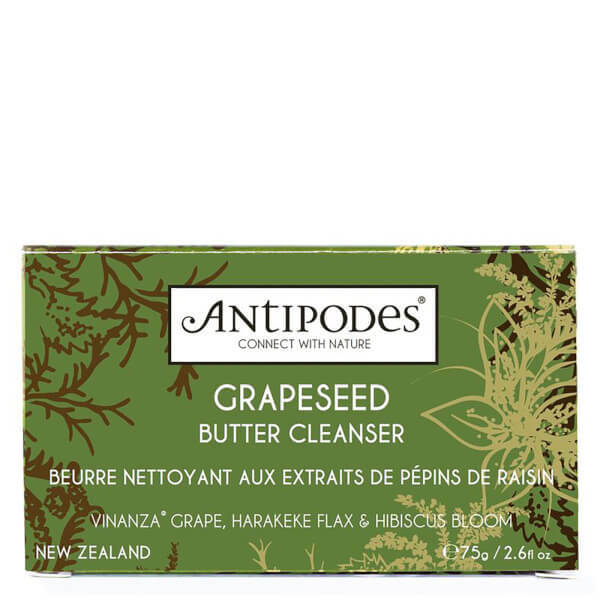 The Grapeseed Butter Cleanser by Antipodes features a luxurious organic formula containing 100% ingredients from natural origins. It works to remove impurities from the skin whilst repairing free radical damage, leaving you with a clear, supple complexion. 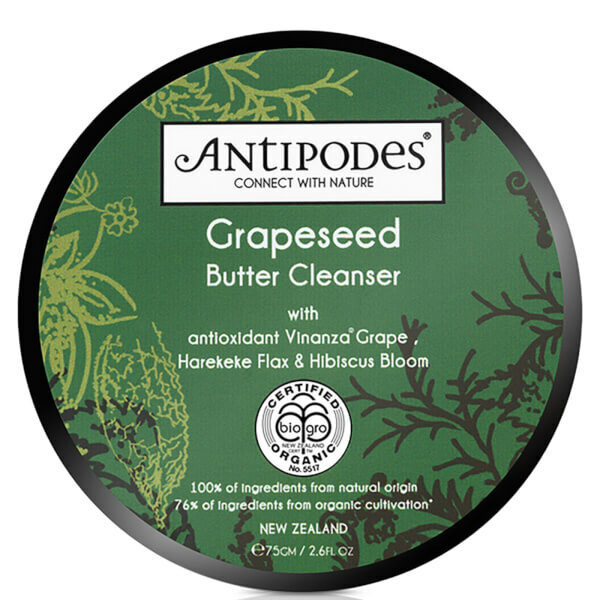 With high level antioxidant grapeseed extracts, harekeke and hibiscus flower in addition to hydrating cacao butter, the cleanser is perfect for dry skin as it's designed to soothe whilst cleaning the complexion. Also formulated with soothing lavender and blue chamomile extracts to soften sensitive skin, the Grapeseed Butter Cleanser promises to provide effective, natural skin care. K.D. Gently massage in a circular motion into face, neck and decolletage at sunrise and sunset, removing impurities and softening skin. Rinse off using a face cloth and water. Olea europaea* (olive oil), butyrospermum parkii (shea butter), phormium tenax* (harekeke flax seed oil), cocos nucifera* (coconut oil), simmondsia chinensis* (jojoba oil), cera alba (beeswax), silica, theobroma cocao (cocoa butter), vitis viniferia (Vinanza Grape seed extract), sorbitan isostearate, matricaria chamomilla (blue chamomile), hibiscus sabdarifa (hibiscus flower), lavendula officinalis (lavender oil), naticide (fragrance & preservative), benzyl alcohol, Vitamin E.